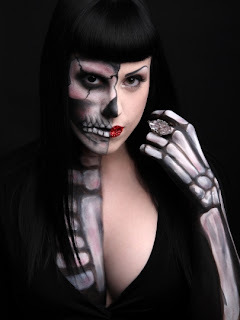 KAT VON PIRE | Make-Up Artist: Follow me on Twitter! First, I would like you all to know that I'm writing this post while looking positively ridiculous in a Mario Badescu Whitening Mask (pure love!). And I always leave it on way too long, so it's cracking & dusting all over the keyboard. Picture it, please. I've been a little absent these past two weeks and I have all sorts of excuses. Canada Day long weekend, which also happens to be my birthday (July 1st! 29! ), weddings, work on two different TV shows, and for the most part having a little 'me' time for the past couple of days. But you can keep up with my antics on Twitter and Facebook, where I usually make daily appearances. Twitter being my current go to for all those moments I just have to share (like my recent Illamasqua haul!). I often Tweet or Facebook on set as well, when permitted, or during breaks. And love posting pictures on Twitter and Instagram! So between blog posts, if you want to keep up with me, click those social media icons to the right of this post. Follow me on Twitter & Instagram and let's be Facebook friends! Or search Kat Von Pire, you'll find me. Come back this weekend for some rad blogs! Brides and bridal make-up artists, you won't want to miss this! I'm sharing my wedding do's & don'ts for a beautiful bride. Now if you'll excuse me, time to wash this mask off and have fantastic feeling skin!